The most famous collector pull toys were created in the 1930’s by popular brands such as Fisher Price and Lego. Pull toys made during this time were wooden, had string attached for a young child to pull along with the majority of them having wheels attached to the base. Many pull toys were animal or car shaped, painted and hand crafted. Animals such as lions, horses, dogs, lambs, goats and bears were popular pull toys created during the 1930’s. Well known pull toys collected today include the 1935 Lego Duck and the 1923 No. 4 Liberty Coaster Wooden Wagon. 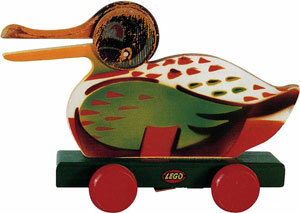 Released in 1935, this wooden duck on wheels would be one of the first toys made by the Lego company. Not only one of Lego’s first toys made but also amongst the most popular within the wooden toy collection. Made completely of wood, the Lego duck features a painted orange mouth, a red body and black wings, tail and head. The duck sits upon a black plank with four red wheels. The beauty of this antique wooden toy is that when the child pulls it along the beak of the duck opens and closes. These were hand painted by workers of the Lego company making each wooden duck slightly different. Later versions of the wooden ducks were painted using stencils. Originally these toys sold for not much more than one USD. Today these are highly sought after collectors items making them worth upwards of $2000.